Remove the skin of the fillets. Rub them with salt and pepper. Arrange the fillets over a greased Pyrex/oven tray. Meanwhile, melt the butter and then take it to a small bowl. Mix parsley, garlic and parmesan. Apply this sauce generously all over the fillets with a brush. 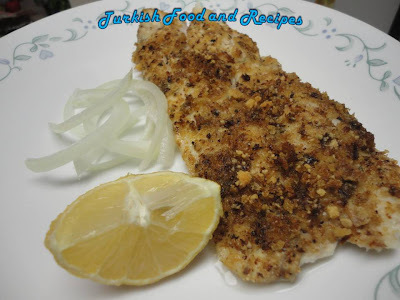 Finally, cover the fillets with the bread crumbs. Preheat the oven to 400F (200C) and bake the red snapper until it’s flaky and soft (for about 20-30 minutes, depending on the thickness). Serve with lemon wedges and onion if desired. Balik filetolarinin derisini alin. Tuz ve karabiber serpin ve elinizle hafifce ovarak yedirin. Yaglanmis borcam ya da firin tepsisine filetolari yerlestirin. Tereyagini eritin ve kucuk bir kaseye alin. Sarimsak, maydanoz ve parmesan peynirini de ilave edin. Firca yardimiyla hazirladiginiz sosu baliklarin uzerine bol bol surun. Son olarak, galeta unu ya da ekmek kirintilarini baliklarin uzerine esit olarak yayin. Onceden isitilmis olan 200C (400F) firinda baliklar pisip uzerleri hafifce kizarana dek 20-30 dakika kadar pisirin. Yaninda limon ve sogan ile servis yapabilirsiniz. Looks wonderful...I can jsut taste it with the juiv=ce of your lemon wedge. It looks so luscious! Can’t wait to try it at home and let my family taste it. Moreover, www.gourmandia.fr has lots of cooking cuisines that you'll surely love!